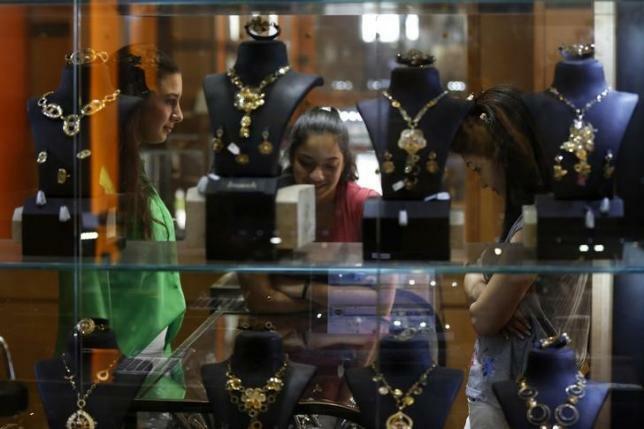 LONDON – Gold rose to its highest level since early July on Monday as expectations that the Federal Reserve will postpone an expected US interest rate hike beyond the end of the year pressured the dollar to three-week lows against a currency basket. The dollar index was down 0.1 percent on the day, stung by doubts that US rates will rise this year. Spot gold reached a peak of $1,169.00 an ounce and was up 0.9 percent at $1,167.96 an ounce at 1215 GMT, while U.S. gold futures for December delivery were up $12.00 an ounce at $1,167.90. Bets that US rates would rise this year, boosting the opportunity cost of holding gold while lifting the dollar, pushed gold prices to 5-1/2 year lows in July. However, mixed U.S. economic data and fears that a broader global economic slowdown would affect US growth have since dampened those expectations. Prices are now little changed in the year to date. Fed policymakers could still raise rates this year but that is “an expectation, not a commitment”, and could change if the global economy pushes the U.S. economy further off course, Fed Vice Chairman Stanley Fischer said over the weekend. Hedge funds and money managers raised their bullish bets in COMEX gold and silver to four-month highs in the week ended Oct. 6, data showed on Friday, amid expectations the Fed will delay a much-anticipated rate hike. In South Africa, the Association of Mineworkers and Construction Union voted on Sunday to strike at the operations of AngloGold Ashanti, Harmony Gold and Sibanye Gold.